To concretize the contemporary view of essential things. On a bit of an ingest cycle, with some major posts on the way, but they keep informing each other in very interesting ways making it very difficult to get any one of them done. So in the interim, I thought I would share some nuggets from what I've been reading. The first comes from the massive monograph on Aldo van Eyck by Francis Struaven. The daunting task Strauven set himself was to present van Eyck's work and thought as a consistent theory. The structure—alternating chapters outlining major components from van Eyck's thought with chapters detailing his output in projects and teaching—is incredibly effective and would be well emulated for presenting paired theory and practice that are cohesive yet complex. He was almost the only architect at the core of the modern movement to formulate a fundamental critique of modern architecture. On the one hand, he strongly opposed its reductive rationalism, its obsession with industrial production and its alienating abstractions. He relentlessly strove, on the other, to graft it back onto its avant-garde roots and to develop it into a meaningful contemporary language. In a period when design was increasingly being reduced to a problem-solving discipline, he defended the idea that architecture, beyond being functional, should be a bearer of meaning. It goes without saying that designing the churches—a task which has since time immemorial presented the challenge to concretize the contemporary view of essential things—presented him with a unique opportunity to actualize a pure expression of the new reality, unencumbered by functional inconveniences. We might take issue with the idea that churches are "unencumbered by functional inconveniences." That is more a characteristic of chapels, and the programmatic complexity of van Eyck's Pastor van Ars, Den Haag in particular is an achievement in meeting but surpassing its functions. 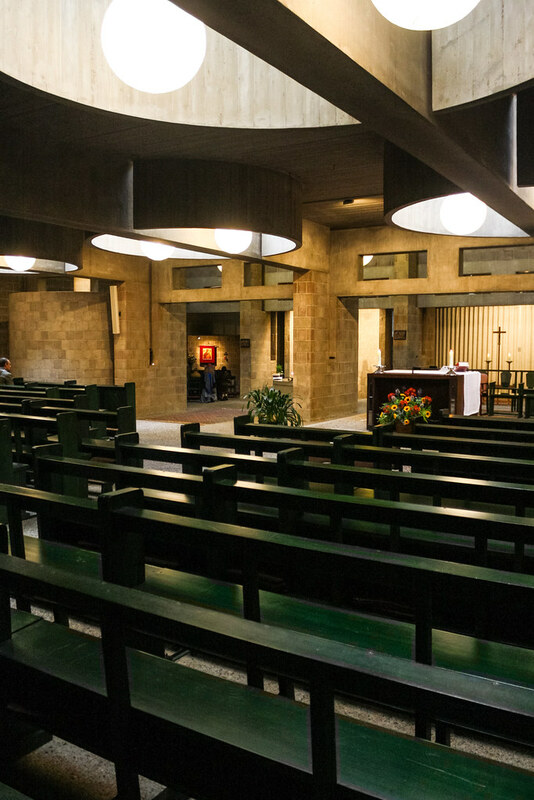 But I love the way he stated the task of designing churches: "to concretize the contemporary view of essential things." The other quote I would like to share comes from the Afterword (subtitlesd "Making Differences") written by Rowan Williams (later Archbishop of Canterbury) to a collection of essays entitled Balthasar at the End of Modernity. It is a statement that immediately made complete sense and turned on its head an assumption whose tenuousness I had not yet realized. 'The divine' is not present in creation in the form of 'hints of transcendence,' points in the created order where finitude and creatureliness appear to thin out or open up to a mysterious infinity, but in creation being itself — which includes, paradoxically, creation being itself in unfinishedness, time-taking, pain, and death. That is just scratching the surface there.